Should you invest in CDSL IPO??? Welcome again for another article on IPO. Now I know we are concentrating on IPOs more in recent times but its IPO flood out there and we all are trying to swim through it catching the bigger fish from the waters. So without ado, the IPO we are gonna discuss about today is called Central Depository Services (India) Limited. The issue has opened on 19th June 2017 and shall close on 21st June 2017. This issue is demanding a maximum of Rs 149 per share with a minimum lot of 100 shares. So should you invest in CDSL? 1. The company also provides Corporate Action Services such as conversion of securities, bonus etc. 2. It also provides facilities to hold Insurance Policies in electronic form. The company is one of the major Depositories in the country and second only to NSDL. Further it’s promoted by BSE Ltd which is well needless to say the oldest stock exchange in Asia. So it’s sort of a vertical integration that BSE Ltd has done with CDSL and I guess we can call this as a niche area or an industry where we don’t really have any other players good enough like the leaders. Since the Promoters are selling their stake through this IPO the company will not receive any proceeds from the offer. 1. The company’s networth is Rs 397.19 Crs as on 30.09.2016 comprising of Rs 104.5 Crs capital and Rs 292.69 Crs of reserves. 2. 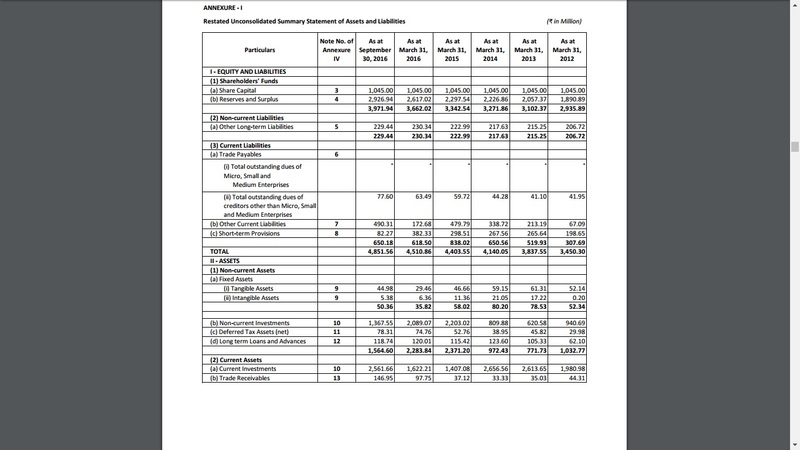 Its long term liabilities stand at Rs 22.94 Crs as on 30.09.2016 rendering its Long term Debt Equity ratio at just 0.06 times and its total liabilities stands at Rs 87.96 Crs rendering its Total Debt Equity ratio at 0.22 times. I mean the company hardly has any debts. I can be rest assured investors are the king in this company. 3. Now the company doesn’t have much of tangible assets. As on 30.09.2016 the company’s Tangible assets were at Rs 4.5 Crs and intangible assets were at Rs 0.53 Crs. 4. What the company has acquired most from its funds are investments. It has 136.75 Crs worth of noncurrent investments as on 30.09.2016 and Rs 256.17 Rs worth of current investments. I guess we can call this as an investment company rather than a Depository. It has huge investments in equity instruments, bonds and mutual funds. So this is a two in one company. 5. Coming to the profits part. The company’s revenue from operations for the year 2015-16 stood at Rs 101.73 Crs of which attributable Profits After Tax stood at Rs 63.39 Crs. That’s roughly 62.31%. I havnt seen such a company before. A company with above 60% Net Profit ratio. Now that’s no joke. Even in the 6 months of FY 2016-17 the company has already achieved a revenue of Rs 58.47 Crs amounting to a profit of Rs 31 Crs. Further since the markets are going well I am sure it will beat its previous year’s record. 6. It is also noteworthy to see that the company has other incomes worth Rs 14.34 in the FY 2015-16 and Rs 14.29 for the half year of FY 2016-17. Which is roughly 15% of its revenue from operations. Its investments are really paying off. The company is demanding Rs 149 per share with a minimum lot of 100 shares. 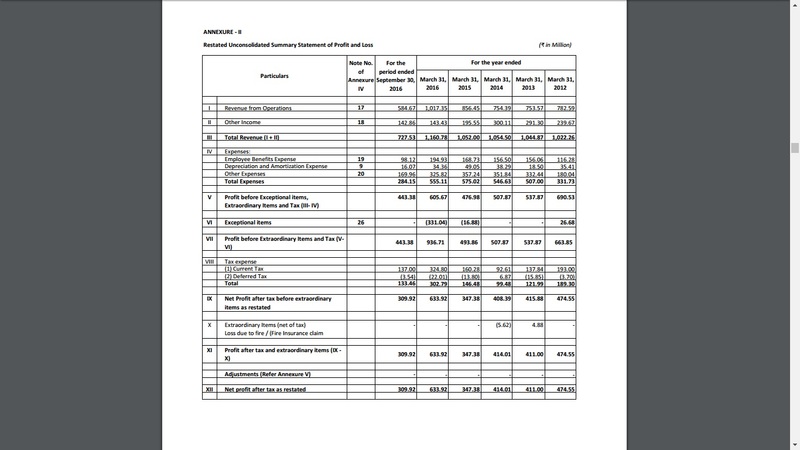 Now the EPS of the company for the year 2015-16 is Rs 6.07. Which means that the company is demanding a valuation with a PE multiple of 24.55 times. It is to be noted that this is the first of its kind to be listed. Therefore it’s a little difficult to compare it with its peers. Although it’s also an investment company, its major revenues are not from investments and therefore it’s not diligent to compare it with investment companies as well. Therefore I made a small sneak peek into its top competitors. Which is obviously NSDL. 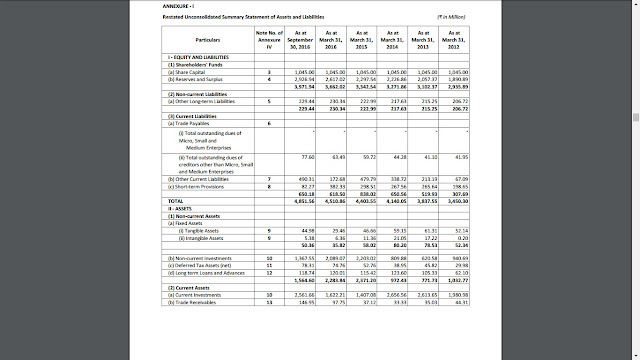 NSDLs operating revenue is Rs 137.50 Crs for FY 2015-16 and other income is Rs 30.57 Crs. Profit after Tax for the same period comes up to 81.99 Crs. 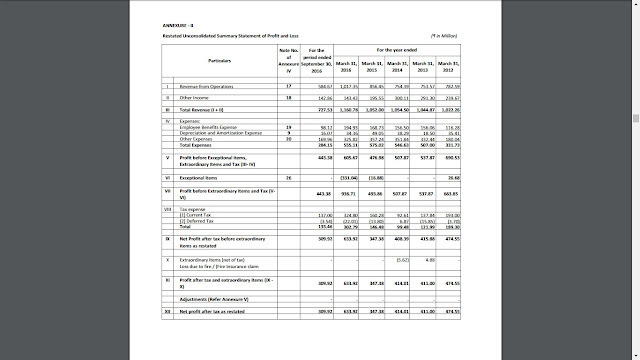 Now that’s a Net Profit Ratio of 49% approx(including Exceptional items). So looking at its peer it surely looks like CDSL is very much in form. I believe that when it comes to the crease we can surely expect a shot out of the boundary line on the first ball and going further to score centuries ahead. So CDSL is a must have in your portfolio. Do invest in this IPO. It’s a subscribe from us. Should You Invest in Au Financiers (India) Ltd? Should you invest in GTPL Hathway Ltd IPO? Should You Invest In Eris Lifesciences Ltd IPO? 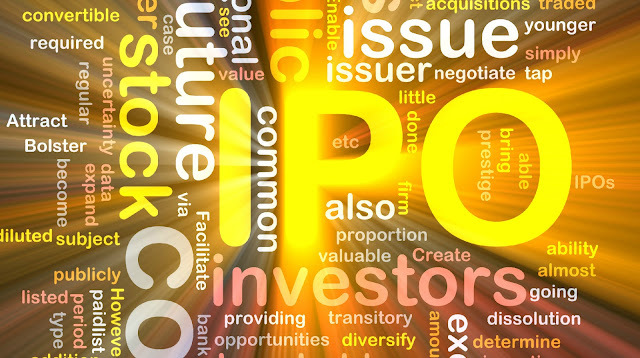 Things to know before investing in Tejas IPO!!!! Best Dividend Mutual Funds to Invest now!!! !